Love this! Such a great feel! Nice shot! So many perfect elements! The reflection, the evening glow, the composition! PERFECT! Great composition like the reflections. WOW! So beautiful ... Would love to know the particulars. Camera, settings, lens??? I am looking to purchase a new Pro Camera. wonderful...thanks for caring me back home.. 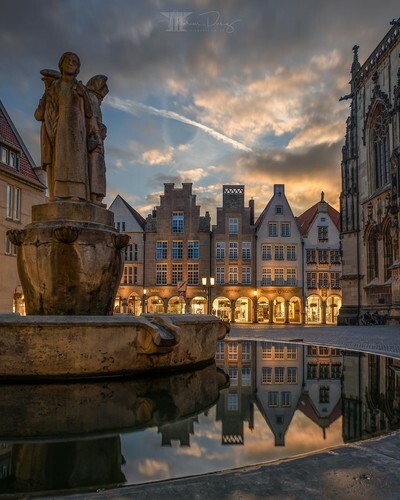 The famous Prinzipalmarkt of Muenster, as seen from the Lamberti fountain. Not the most original composition I guess, but still a beautiful one. I was quite happy to get those reflections when they turned off the fountain, just in time around sunset.